Well, what a front cover we have for you this term. 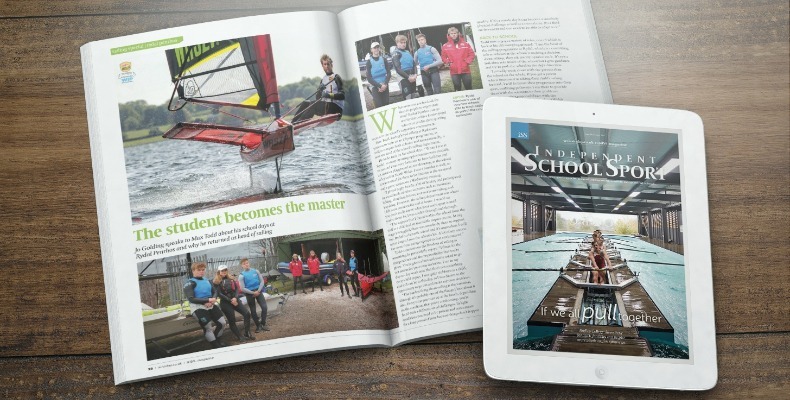 John Dabell finds out more about Radley College’s innovative rowing centre on page 9. The rowing tank mimics real river conditions but in a safe environment, and this new facility has actually resulted in an increased uptake in rowing by the younger boys. At the end of the day, isn’t that all schools can ask for? More students willing to give things a go because, understandably, trying something new can be a challenge. But with these excellent facilities, come more pupils that are really excited to try them out. Worth the investment? For sure. We are very lucky to have Gary Burgess, head of officiating for England Netball, on board for this issue too. In his feature on page 23, he has written about how schools can use trips to encourage more enthusiasm for sport this summer. After all, an unforgettable sports trip could be the difference between a child forming life-long healthy habits and losing confidence in a sport. It’s the buzz of a live sporting environment that simply can’t be matched in a classroom, Burgess says. Autumn/Winter ’17 issue of Independent School Sport is here!